Annabelle Vs Chucky Movie: Could It Happen? The Conjuring spin-off Annabelle was a hit at the box office this past weekend, pulling in $37.2 million from a $6.5 budget. This performance has surely ushered in a new horror franchise, but another possessed doll isn't taking the competition lightly. 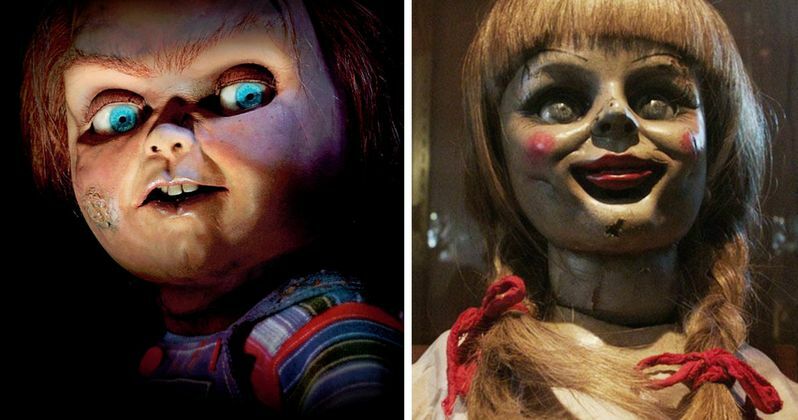 Will we see a Chucky Vs. Annabelle team-up movie sometime in the near future? "I am hoping that at some future point we have Annabelle and Chucky team up." Sadly, we may have to wait a very longtime for this to actually happen. "I can see that (even) in 20 years from now." Don Mancini wrote the first Child's Play in 1988, and eventually returned to direct the last two installments, 2004's Seed of Chucky and last year's Curse of Chucky. He is currently preparing to bring Chucky back to the big screen sometime in the near future, and it's possible that Annabelle could have a cameo. "We would be into it, the only problem is that we are in different studios. That would probably be years worth of red tape to work it out. But if it all could be worked out, then yes, we're very into it." Though its very unlikely that this crossover/team-up movie will happen in the near future, Don Mancini did reveal that would be first in line, as to get acquainted with Annabelle's fighting style for any possible brawl that Chucky might eventually find himself involved with sometime down the road.